Since 1974, buyers have been traveling great distances to find some good treasures at the Quaker City Flea Market in PA. This indoor and outdoor market has an array of products being sold including purses, jewelry, furniture, toys, video games, and all the latest trending products as well as antiques and collectibles. Located just minutes away from the Center City, this market is considered to be the city’s oldest continuously running same-site flea market. The Quaker City Flea Market has been operating at the same location since they first opened in 1974. The market’s success grew quickly and they soon decided to expand their selling space outdoors. Around 125 vendors come and sell their products every weekend and most of them have been there since the very beginning. 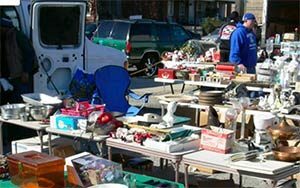 Visit the Quaker City Flea Market and see for yourself why it is a Philadelphia landmark and jewel. If you have any questions or wish to inquire about vendor leasing, you can call them at 215-744-2022 or stop in during their normal business hours. Items being sold at the market are constantly changing, and even though vendors do sell new and trendy items, the Quaker City Flea Market has gained its reputation for being uniquely focused on selling rare items and collectibles. Be sure to also check out their wide range of food vendors selling tasty treats!